I am so impressed that they dug out the old awning and restored it. Hurray! Carr established the bank with seed capital of $11,000 of his own money, $100,000 of seed capital from James Augustus Bryan, president of the National Bank of New Bern (enough to make his 23 year old son Charles, just graduated from Princeton, vice-president of the new bank,) and money from 24 other subscribers. The United States Department of Treasury granted a charter to First National Bank on November 9, 1887 to conduct general banking and issue notes. By the end of its first year in business, First National Bank had deposits totaling $125,265.15, and had made a profit of $7276.10. 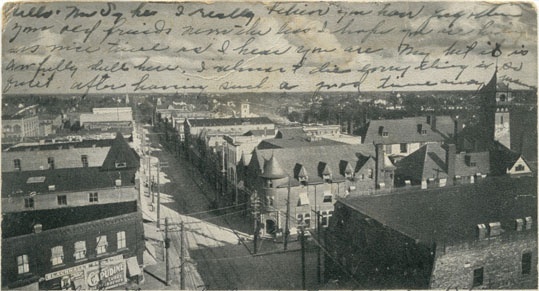 This view, taken from the top of the Trust building, looking east on Main Street and to the southeast, dates from between 1905 and 1907. It shows the First National Bank building on the facing corner. 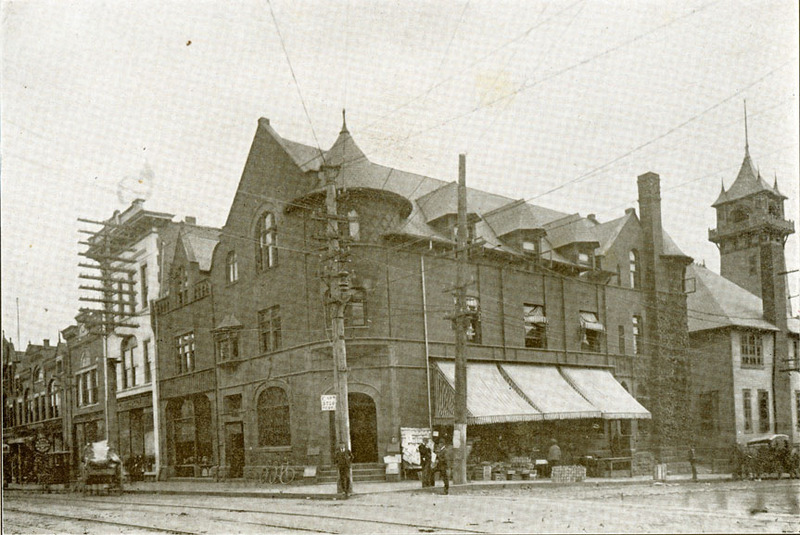 Also visible is the Hotel Carrolina, just to the south of the bank, the mansard roof of the Hackney Pharmacy building on the southwest corner, and Blacknall's pharmacy on the northeast corner (prior to the large fire which consumed that block). I can tell the approximate date of this photo because the tower of Union Station is visible in the distance (built in 1905) and the Hotel Carrolina is still standing (burned 1907). 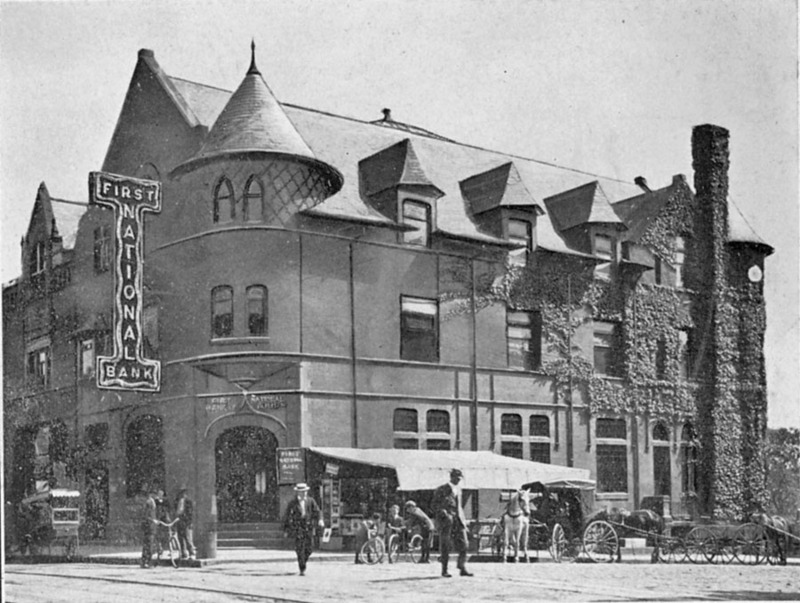 First National Bank, ~1910 - after the Hotel Carrolina has burned. 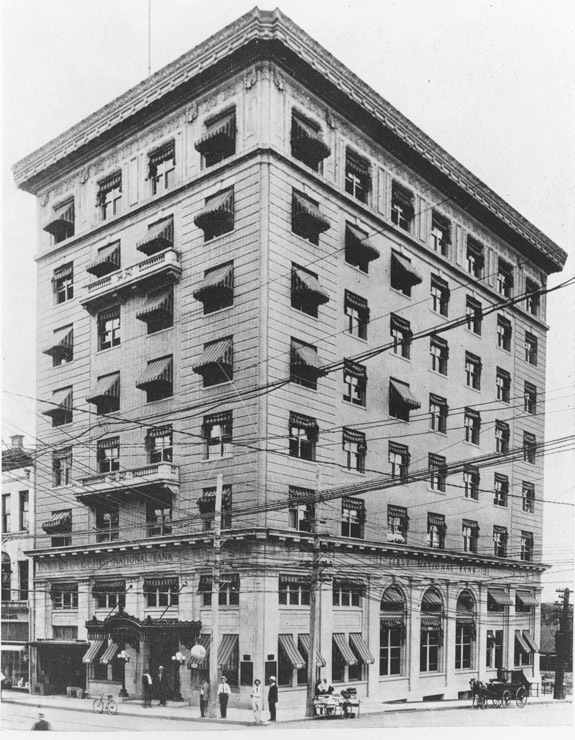 In 1914, the company demolished the original red brick Queen Anne structure to build a large neoclassical revivial replacement structure of seven stories, designed by architects Milburn and Heister. With the streetcar going by, 1927. In 1933, the bank became known as Depositors National Bank. Side windows (Corcoran) above the sidewalk, 1940. In the late 1950s, Security National Bank and Depositors National Bank of Greensboro and Depositors National Bank merged, but rapidly began discussions with American Commercial Bank of Charlotte. On July 1, 1960, the institutions merged to become North Carolina National Bank. At some point thereafter, the original balconies were removed from the front of the building. 1982 view, looking south down Corcoran. The canopy was removed from the building sometime later. Aerial looking north at downtown, 02.01.89; the red "NCNB" logo is on the white-painted back of the building. I'm not clear as to when NCNB abandoned downtown Durham. It appears that the building was sold to Carver Investment Group, comprised of Terry Sanford and Clay Hamner of Brightleaf, Erwin Square, and Treyburn fame and Roy J. Carver, by NCNB in 1981, but NCNB seems to have occupied the building after that point. Self-Help Ventures Fund acquired the building from Carver Investment Group in 2001. They renovated the building, with local historic architecture superstar Eddie Belk - which included locating the old canopy that had been removed from the front entry, restoring it, and replacing it in its rightful location. I'm not sure how it ended up in such bad shape, below. Self-Help currently leases the building as office space.